The trail actually goes through much of western new york although not all is accessible to bikers. This chunk though has pretty much everything though. Creek crossings, tight singletrack, roots, some short climbs. Basically a fast trail but pretty technical. Especially for the area. Only the one trail so just keep going til you get tired then turn around. Review: Deceptively difficult! This is a -really- nice and fairly fast trail. It's just a good old-school hiking trail that happens to work well for mountain biking...there are no jumps, no skinnys, no drops or other mountain bike trail cliches that I ran into. That said, many of the numerous creek crossings are quite difficult (severe angles of departure and approach with tons of roots and rocks) and will challenge even skilled riders. The trail has several dramatic and scenic overlooks of the Genesee river and gorge, so get your phone camera ready. The trail is linear (not a loop) so plan accordingly. Getting there: Google "Mount Morris Dam & Recreation Area." That will take you right to the free parking lot right next to the trail head....do NOT go to Letchworth State Park - it's on the other side of the river and you have to pay to get in. Review: This trail has loads of potential as a great all-day epic ride. Unfortunately it's just not really a mountain bike trail. Attempted to ride it starting around Dygert Rd, then getting on the FLT heading north. Followed it for about an hour before bailing out on one of the side-paths, but there were so many downed trees and repetitive creek crossings that it was impossible to actually stay on the bike for more than a minute or two. We didn't see any evidence that the fallen trees ever get cleared. I'd call it more of a bike-assisted hike. The rideable parts were pretty fun, but there's much better riding around. I guess it's a good ride if you don't mind walking your bike every couple minutes, but there was no way to get any kind of rhythm going. Review: This trail has a little bit of everything for the intermediate rider . Review: great trail beautiful scenery some pretty sweet descents and if you ride the entire 25 miles then you should reward yourself by going into town to the local pizza shop and grab one of the most amazing philly cheesesteaks ever created! Review: The FLT through Letchworth State park is about 25 miles long, one-way. The FLT only allows bikes inside the confines of the park, so you're not supposed to branch out on any of the cool little side trails or go out of the park. Still, the 25 miles is pretty tough. Lots of hills, plenty of perilous creek crossings too. Mostly doubletrack. Parking and maps are really good here. Also, the scenery is amazing. Review: This is one of my favorite trails in the area. I typically park in the Mt. Morris Dam parking lot and use the mile between the Hogsback overlook and the parking lot to warm up my legs. The scenery is second to none for trails in this area as it looks over the Letchworth gorge. It is especially beautiful in the fall as the leaves are turning. There are great lookouts at several points in the first couple of miles but after that you lose the gorge and you continue through the woods and the numerous stream crossings. The trail is nice because if you for some reason don't feel like going back on the trail you can always ride out to River Road on one of the 2 or 3 access trails and take the roads back to your car. If you are up for a challenge ride the entire FLT from the dam to Portageville. We typically park a car at each end in case of serious injury, bike break-down and a place for extra food/water. This will generally take you 3 to 4 hours. A couple of weeks ago I rode from the dam to Portageville where we had parked are other car. We filled up our camelbaks/bottles and grabbed some food and rode the trail back to the dam. It took about 7.5 hours of total ride time and we were glad to get off our bikes. It is definately not greenway riding as there are lots of challenging climbs and technical sections that keep you loving the trail. Definitely one of the best trails in the area. Review: Fun trail has some nice scenery. It goes for a long ways. You have the ability to kick out at almost any point and return via the road. Great day trip if you want to do the long haul. I usaully get about 10-12 miles in and kick out to the road. Bring a camera for the first 3 miles after that forget about seeing much but trail. Review: One of my favorite rides. There are some very challenging switchbacks and creek crossings but overall this is a very fast trail when dry. It can be a huge mess when wet so take note of the sign in the second parking lot about trail conditions. I've also ridden a nice section of this trail several miles away. Rather than turning right onto Dam rd keep going straight several miles away the road comes to a Y vear right on to the dirt road and there is a trail head just to the right. Similar Trail: Tryon -- Letchworth is much less busy and much more scenic. Finger Lakes Trail - Mt. 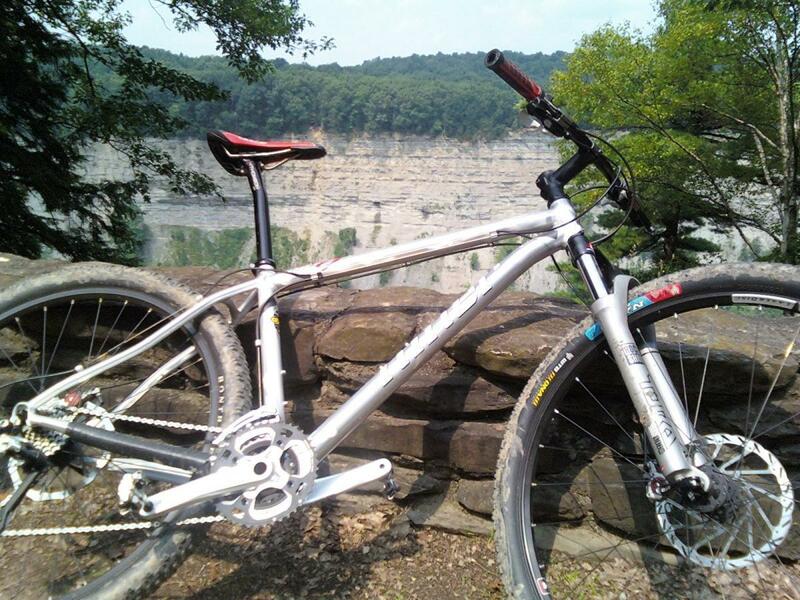 Morris/letchworth State Park MTB Trail 4.33 out of 5 based on 13 ratings. 13 user reviews.